Apple Vale Alpacas: New fibre colours released! 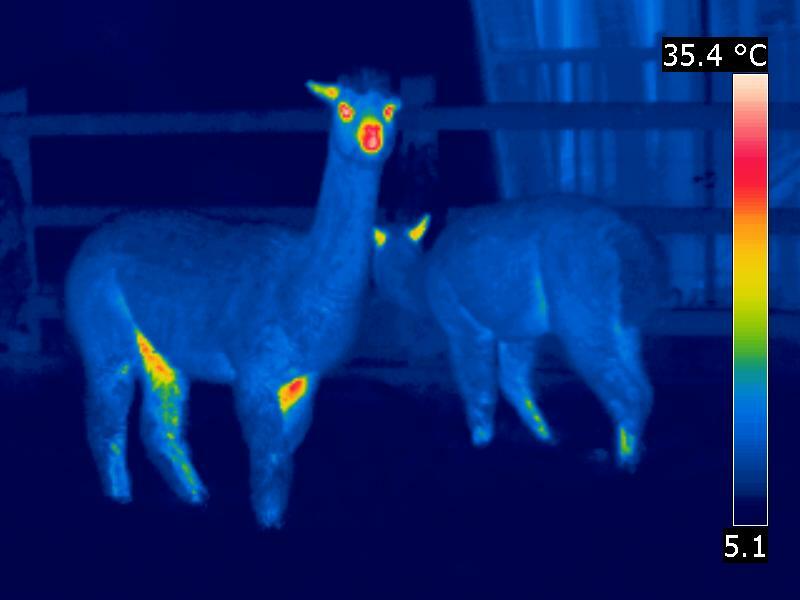 Given that an alpacas normal internal body temperature is 37-39deg Centigrade, the figures aren't so surprising - the air temperature was probably around 8deg., and the sun was just about to set. As the temperatures plummeted this week, we were a little concerned about Moira, our ten-year-old maiden - she has a very short fleece, but very fine - she was shorn last summer but not the year before. We had thought about a coat, but realistically, we wondered about her accepting it - could you persuade your grandmother to change her ways? So I opened the double doors of the hay shed, put down a straw bed, some tempting buckets of alfalfa, and set up a mirror for encouragement - they all cautiously looked around, went in, and tucked in. At 11 o'clock, I went out with a torch...there they were, all sat on top of the hill - it was around about minus five - and that's where they spent the two coldest nights! In the afternoon, had a handful of carrot chopped into long lengths, which Moira and Autumn Gold happily take from my hand - Camelot however, is 19 days into his weaning, and sniffed at the carrot but wouldn't take it horizontally, so I slowly turned it upright, resembling a teat perhaps, and he quite happily went underneath and took it into his mouth! 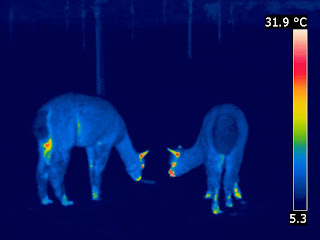 Very intersting Dave, shows that they just aren't bothered by this cold dry weather. Yes, it's strange isn't it but ours too choose to sleep outside on frosty nights. I suppose it's part of their inheritance as the alti-plano gets bitterly cold at night. Love the idea of a mirror...! Great blog Dave. 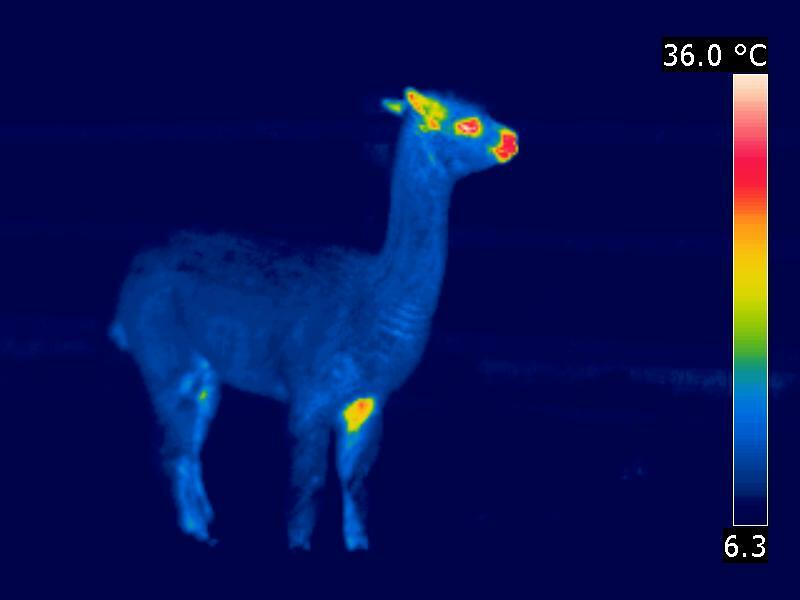 I think that we are all in agreement; alpacas don't mind the cold at all...but rain that is a different matter. I realised quickly, that I should have had an image of me taken for comparison (yes, clothed!). Thanks to Chris for the images, who is happy with anonymity. 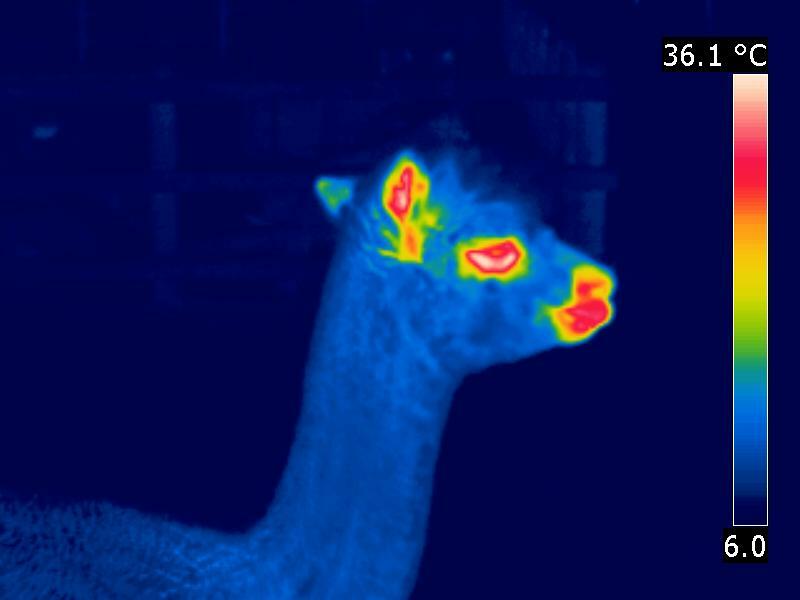 The fact that the camera can't 'see' their body heat beneath their fleece just goes to show how good an insulator it is, and hence why they're so content to sit out in freezing temperatures!